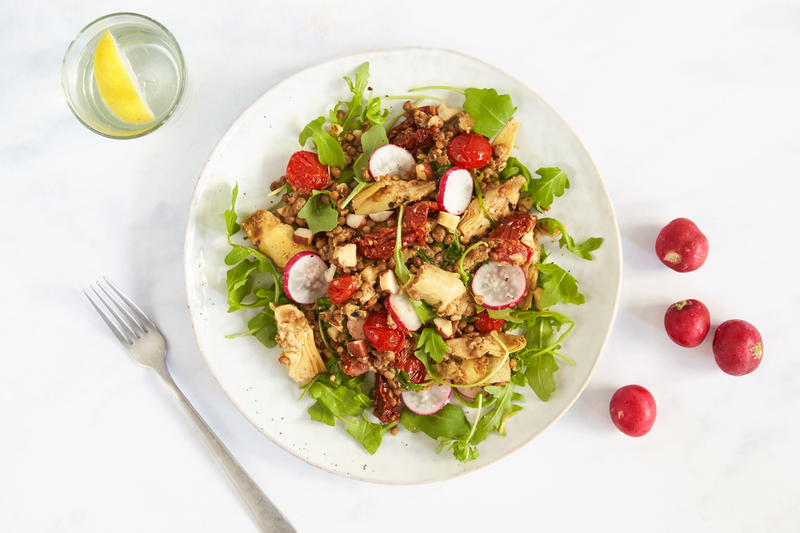 We use sumptuous Brazil nuts in this fresh basil pesto dressing, which we drizzle over Mediterranean-style warm lentils packed with sundried tomatoes, artichoke hearts and peppery rocket. 1. Cut the cherry tomatoes in half. Thinly slice the radishes and crush or finely chop the garlic. 2. Slice the artichoke hearts into quarters and slice the sundried tomatoes in half. Drain and rinse the lentils. 3. In a medium-sized pan, heat 1 tsp oil on a medium heat and add half of the garlic and cook for 1 min. Add the cherry tomatoes, sundried tomatoes and artichokes to the pan for 2 mins, then add the lentils and cook for 5 mins, stirring occasionally. Remove from the pan and leave to cool in a bowl for 5 mins. 4. Meanwhile, to make the dressing; finely chop the Brazil nuts and mix with the basil pesto, remaining garlic and 1 tbsp olive oil. Mix well and season with sea salt and black pepper. 5. Add the rocket, sliced radishes and Brazil nut dressing to the bowl with the lentils and stir to combine. 6. Serve the Brazil nut, artichoke and pesto lentils on two warm plates.